April 7, 2011: approximately 8 AM, leaving Toronto to Aberdeen, Washington. Ceremonies with the Anishinabe on 8, 9th and tours. April 10th: start Send Off with the water and walk until 17th. April 20th: start Send Off with the water and walk until 28th. “Ni guh Izhi chigay Nibi onji” – Keep saying this! Meaning: “I will do it for the water”. Consider this a call for commitments to lead in any one of the four cardinal points of this spring’s water walk. It is so important to identify who the leaders will be so that we can begin planning the journey to the centre. Please let us know in writing that you will take on this monumental task of caring for the safe journey of salt water to the freshness Lake Superior. You can then call on your own supporters for the journey. I propose to take on a cardinal point that will not be committed. Please remember that our youth are to be the main walkers throughout the journey. Even if they can’t make it all the way they will be acknowledged in the history book of water walkers. Also, we will desperately need one or two volunteers to monitor the whereabouts of the walkers at all times: where they are walking, distance walked, where they are resting, what are they needing; etc…Please consider volunteering for this wonderful work and commit to being on a computer often. Other logistics are on a list for later reference that I have started to compile. It is hoped that young people will be mobilized to walk, speak and honor the water as they walk. Spring is sure to be here soon. It cannot be stressed that more than ever, our need to protect the water and motherearth. She, the elements and the animals need us more than ever before. We are the last of humankind who can make the difference. Our consciousness must be united and clear about our need to protect the only precious resource left that will sustain life. If it’s gone, we’re gone. 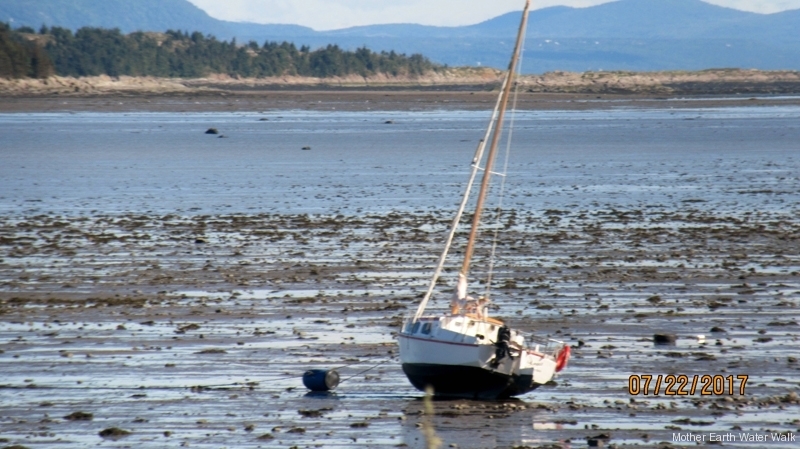 We cannot stand by and expect our government to act on this precious resource. We know all too well economics is the only language they understand and our resources are seen with dollar sign eyes. We must work and act together on this. 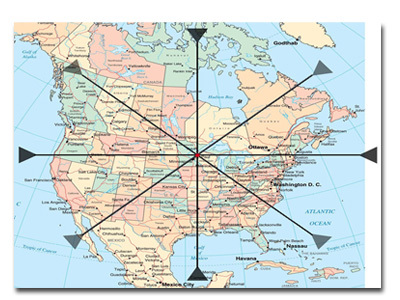 As a starting point someone needs to volunteer to check on mileage from each of the cardinal points up to the destination; that is from the ocean to the destination. Another cardinal group needs to come forward to be the mobilizer for their starting point and up to the destination: to guide, support and be the spokespersons. Once mobilized, the human needs will be determined as to time, start dates, transportation, communication, etc. The young people have asked what can they do. This Waterwalk is their way of doing something for our precious resource. We, grandmothers are getting too old to do much walking, but will be there for you. She will forward all messages to our Waterwalk mailing list. Let Rainey know if you want to be included on this list. Salt water was gathered from the four directions – from the Pacific Ocean, the Gulf of Mexico, the Atlantic Ocean and Hudson Bay. It was gathered in a copper pail and promises were made to care for the water by Nokomis Josephine Mandamin at all four send offs. It is being carried in all four directions by Grandmothers and women to the meeting place. As life-givers, these women are responsible for protecting and carrying that sacred water. On June 11, the Anishinaabe Grandmothers, women, men and youth from Canada and the United States will converge in Bad River, Wisconsin to celebrate. The following day, June 12th, the waters will merge in a ceremony on the shores of Lake Superior. The Mother Earth Water Walk started on April 10th in Olympia, Washington. The gathering in Sault Ste. Marie will reunite two walkers from that western send off… Sylvia Plain and Grandmother Josephine Mandamin… they started the walk together with the salt water from the Pacific Ocean, and they will carry the salt water from the Atlantic Ocean together to the water’s meeting place on the shores of Lake Superior. 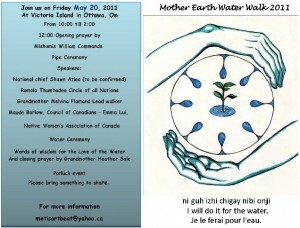 Mother Earth ‘Turtle Island’ Water Walk 2011, East direction, is tentatively scheduled to arrive in Sault Ste. Marie, Ontario, Wednesday evening, June 1… the Eastern directions last stop before leaving Canada. Their route into the Sault will be through Garden River First Nation, avoiding the Hwy 17 bypass. LOCATION: potluck + barbecue being held at Shingwauk Kinoomaage Gamig… everyone welcome! THE WALKERS NEED YOUR HELP! To get them here on time, we need you to join them on the road walking. They rise at approx. 3:30am and are on the road by 4am. You can see their exact location on the LIVE GPS map being hosted at www.emptyglassforwater.ca/map and click on the blue line of text under this map that reads: Click here to see where they are right now! The GPS updates every 10 minutes. Chief Lyle Sayers from Garden River FN has made arrangements with the International bridge to cross on June 2 between 4-5am… they are not going to make this time unless we get some walkers… they are 3/4s of a day away from meeting that. 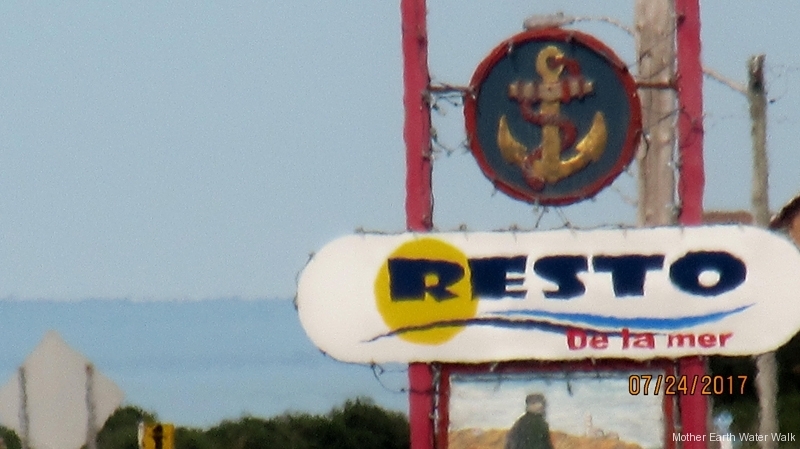 Tonight, May 30th, they will be sleeping in Massey, and a potluck is scheduled in Serpent River First Nation for 6pm… last word was they weren’t sure if they would get that far, but they are trying very hard. 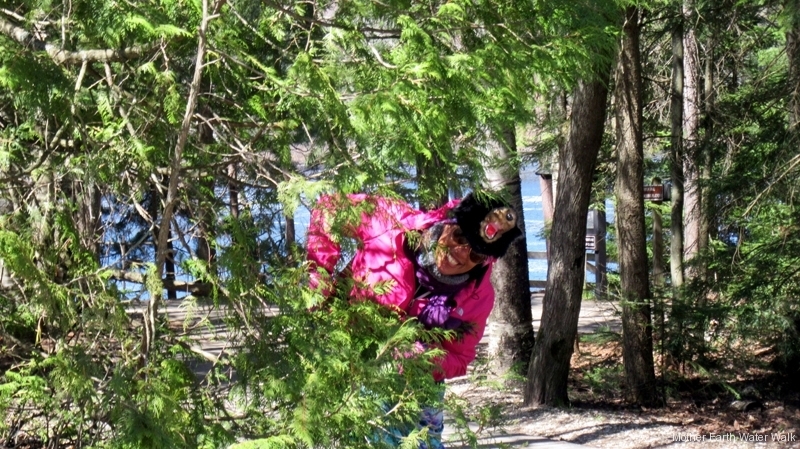 Tomorrow night, May 31st they are tentatively scheduled to be sleeping in Thessalon at the Day Care… i don’t see this happening, unless we can get a lot of walkers out there. The Health Centre in Thessalon is also planning a potluck for the walkers for 6pm. 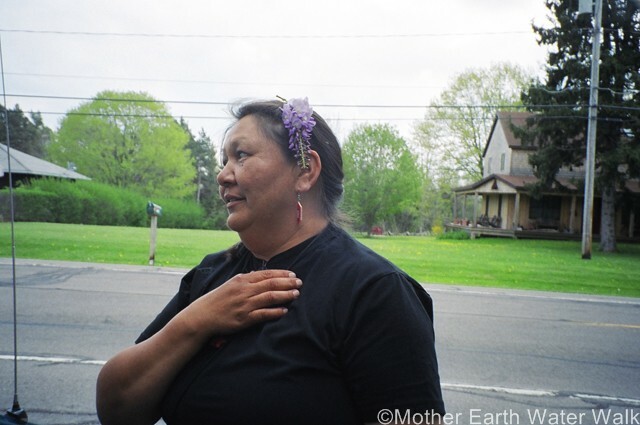 There are a lot of miles to cover right now… Nokomis Josephine Mandamin has been walking and traveling for the water since April 10th, can we do our part and join her and the other walkers for just two days! Let’s get some busloads, van loads, car loads of people out there… this is the North Shore! we can show up in numbers!! Kwewok wear long skirts, everyone bring love for the water. Men come and carry the eagle staff to protect the water and the women. Bring your drums and songs. Let’s make the water dance in the pail because it feels so loved! This is where they are right now on the road…. there is still a lot of daylight hours left to join them…. they are making some good time today; but the schedule to Bad River is unforgiving from here on in. Can you walk with the water? even for a few hours? The walkers are coming through the St. Louis, MO area this week Tuesday/Wednesday and then continuing north along the Mississippi towards Iowa during the rest of the week and weekend.Can you or someone you know join them as the walk to bring attention to the condition of the water?Call/Text 763-464-2790 or j.weber.mn@gmail.comPlease spread the word. Jennifer Weber is on a mission!! 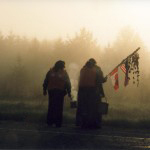 Yesterday, the “Day Kwe” sisters walked alone in the south! She doesn’t want this to happen again! If you can support or participate in the southern direction in any way.. please contact Jennifer… we need walkers and eagle staff carriers. I just want to send out an update about our brave kwe in the south, that have walked through 130 tornados, and a week of levee breach fears, flooded roadways and a malfunctioning gps device!Mike Mulley and the good people at globalstar have been working on the gps, and today sent a new unit to sharon, and she is picking it up on Thursday in Festus, Missouri.Then we can watch her and Dorene beep across the map again.I just wanted you to know that they could really use some walkers and staff carriers…. if you have friends or family near St. Louis, Missouri, send them Sharon’s way. As of now, there is only Sharon and Dorene… one drives the RV while the other carries the pail of water in one hand and the eagle staff in the other… this is how they keep the water moving.Can I hear you all yell “road trip!” Email myself or Sharon to let us know walkers and staff carriers are on the way! p.s. the maps flag is on Chaffee, MO just south of St. Louis. Hi Mother Earth Water Walker friends,”5 of the original southern walkers who were going to walk changed their plans at the last minute, and now we need some help.”Who has contacts in the south, or who can sponsor some responsible youth that are showing leadership skills, to go down there to walk? They are nearing Jackson, Mississippi on Hwy 49. (www.emptyglassforwater.ca/map click on blue line under map for live gps tracking)Josephine will be leaving them in two days to make her way to the EAST send off, so they will be down another walker.They need some help now if you have relatives or friends down south… Josephine has said while the water walk is Anishinaabe led, you do not have to be Anishinaabe to carry the water. The water is for everyone to thank, honour and protect… we need to get the water to the June 12th meeting. The Eastern walkers didn’t quite make it to Sault Ste. Marie (SSM) tonight… they made it to the divided highway just around St. Joe’s island…. please check the gps map. We have been pushing them so hard to make the SSM deadline that they are exhausted, so will be rising late tomorrow, and not starting to walk until 9am…. in case you were planning on joining them. Miigwech for all your support and patience. This is an opportunity for the media to meet the walkers from the West and the North. 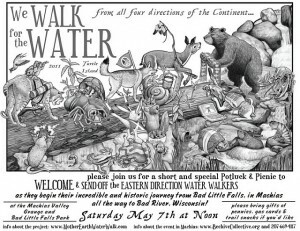 Learn about the history of the water walk, the journey these women have shared with the water and the significance of salt water from the four directions coming together in Bad River, WI with Lake Superior on June 12th. If you are on facebook, go to this page to RSVP. 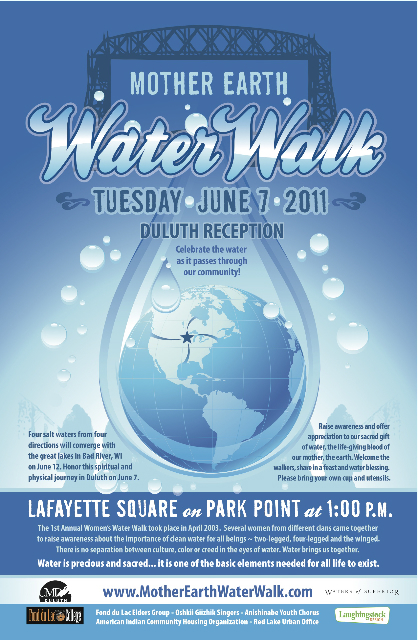 Join us for the Mother Earth Water Walk Duluth Reception! Celebrate the water as it moves through our community, welcome the walkers, share in a water blessing ceremony and feast. Grandmother Josephine will speak and other women will share their experiences on the journey. Mayor Don Ness will bring forward a water proclamation. Parking is available in front of Lafayette Square on both …sides of Minnesota Avenue and at the Park Point Beach House at the end of the Point. There is a bus leaving the Beach House at @ 12:24 that drops off in front of Lafayette. Bus fare is .$75. Last bus returning to the Beach House at 5:57 pm, fare is $1.50. We are reserving the few parking spots in the Lafayette lot for elders and food drop off~ Miigwech. Please dress for the weather, the ceremony will be on the shores of Gitchigaaming. Bring your own cup, utensils and chair. If you would like to contribute food or other donations to the feast, please contact Erin at 218-341-3411 or email at edewitt4970@msn.com. A water walk is being organized in london, ontario on may 25th by local high school students and teachers to give support to the walk.I have accepted the invitation and will acknowledge the Thames River along with young spirits and new messages.Josephine Mandamin has put out to the call to the youth this year and the have really stepped up. I have walked with many of the youth along the way and it has been a blessing to spend time with our strong leaders of tomorrow. Violet Caibaiosai, Wanda Levasseur and Raven Courtney committed to walking with the western part of the Mother Earth Water Walk 2011 on May 16-May 28 from New Town, North Dakota to Cass Lake, Minnesota. Woo Hoo! There is still room for a second DRIVER and another WALKER or STAFF CARRIER in the Van leaving from Winnipeg/Roseau River Monday, May 16th. Any body interested? enough for them and the water.May 1st – May 14thWe have Grandmother Pauline Shirt, her driver, and possibly Rebecca with no vehicle fromMay 14th – May 31stNobody. June 1st – June 7th (where we are meeting the north) We have Esther and maybe Cynthia as a driver with a truck. I’ve talked to Violet, Charlie, my Aunts from back home they are being evacuated out of Roseau. Rainey’s sent out emails on the three fires list serve and we’ve sent out facebook messages. I’ve put out tobacco. I’m not sure what else to do. All peoples are welcome! A time for reconciliation, a crossroad: Unity in Spirit and Actions for Water for the Next Seven Generations of All Peoples, of Colors. Historic time, prophetic time for All Peoples, All Colors. April 10, noon-time on West Coast, that is 3 pm East, 4 pm Maritimes. We will get outside, face the West Direction, raise sacred pipes, hold tobacco-semah, sing the Water Song, or sing what comes to our heart, pray, drum, dance, be with Water from where we are. Sending the Mother Earth Water Walk our good thoughts, blessings for their courage and safety as the West Direction Water Walkers will be on their send-off in Olympia Washington. 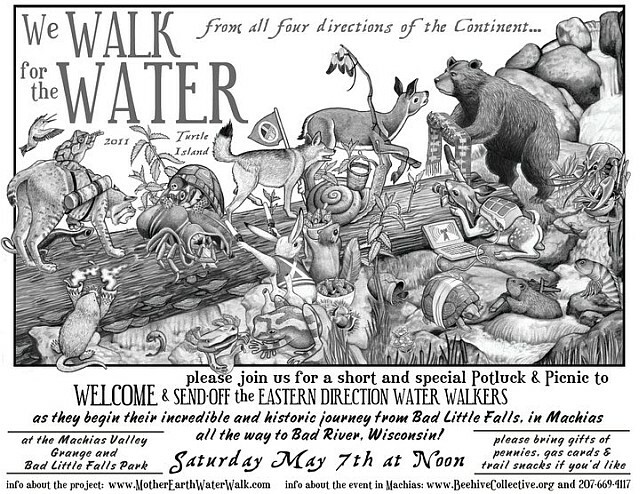 Their Western Direction Sacred Walk is 2 months to destination in Bad River Wisconsin. Walking for Water, for the next Seven Generations. A prophetic time we are in. Miigwetch to the Grand Mother Josephine Mandamin, to the Walkers, and to Eddie Benton for raising consciousness about Water. Miigwetch to all who are supporting in every way you can, through prayers, events, ceremonies, walks in your communities, networking about the Water Walk, through sent messages, drawings, donations. Even with a penny for one step for the Mother Earth Water Walk, that is support too. A call for Unity in Spirit for the sacred life-source Water and for the Next Seven Generations. The next Direction will be South in Gulfport, Mississippi April 10 send-off, then the East in Machias, Maine May 07 send-off, then the North in Churchill, Manitoba, May 21 send-off. All Walkers carrying the sacred healing Ocean Waters and Eagle Staffs will convey on June 12 in Bad River for the Water Ceremonies. We will send messages to fb friends and email friends, contacts, medias about the Sacred Walk for Water. Follow the Walkers at www.emptyglassforwater.ca/map and click on the black bubble on the west coast, Olympia, Washington.